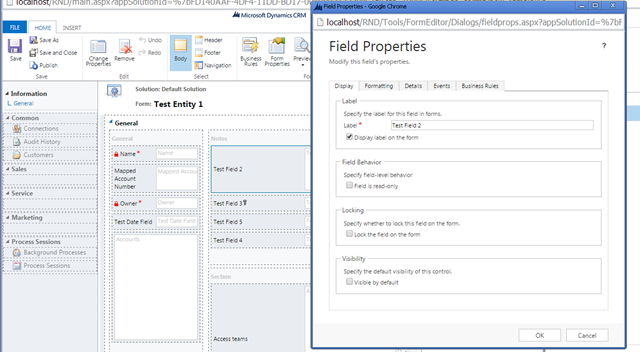 Cross browser support in Microsoft Dynamics CRM was a great feature. Wonderful isn’t it that you can open most of the browser(s) (check for the supported list in MSDN) and your CRM would continue to work seamlessly. And in recent months, I find lot of users have shifted to Chrome while they browse CRM. But recently, during one of my implementations for a customer, we faced a strange problem while using chrome. We were trying to edit the filter criteria and of the views and hide and show some of the fields on the form. Did all the changes and then saved and published the customizations. Whoo! some it took. But alas when we browsed CRM, we can see none of the changes affected. When we went back and checked the customizations, we found that none of the changes we made are actually there. Well let me try to explain couple of the scenarios here. 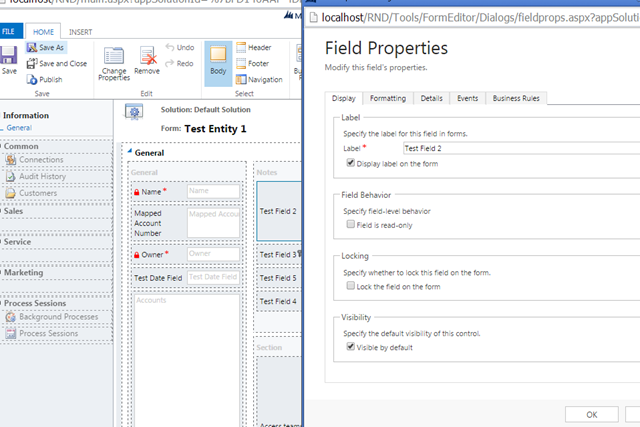 I have an entity called Test entity 1 and as you can see in the screenshot below, I have opened the form for the same in Chrome and have unchecked the box for ‘Visible by Default’ for ‘test field 2’. I now save and publish it. However when i open the editor back, I can still see the ‘visible by default’ checkbox in checked state. Similarly, editing views and a whole lot of other customization stuffs wont work in Chrome. I have tried this in MSCRM 2013 with UR2 and Chrome version 37 & above. So as of now guys stick to IE before any UR releases by Microsoft to fix the same. Next Post Issue with Dynamics CRM 2013 SP1 upgrade after database import through CRM import wizard. Thanks a lot. Really a good one. I will include this link in my post.